What you discover when you read the fine print! There I was re-sorting my collection of research CDs when I turned one over and actually read the BACK of the cover! I KNEW what I would find in a Sands and McDougall’s Melbourne and Suburban Directory! I had used so many over the years. I also knew how important it was to use the STREET directory part and not just the SURNAME part. I researched houses so often that it was crucial that I use the STREET directory part to ensure I didn’t miss anything important. 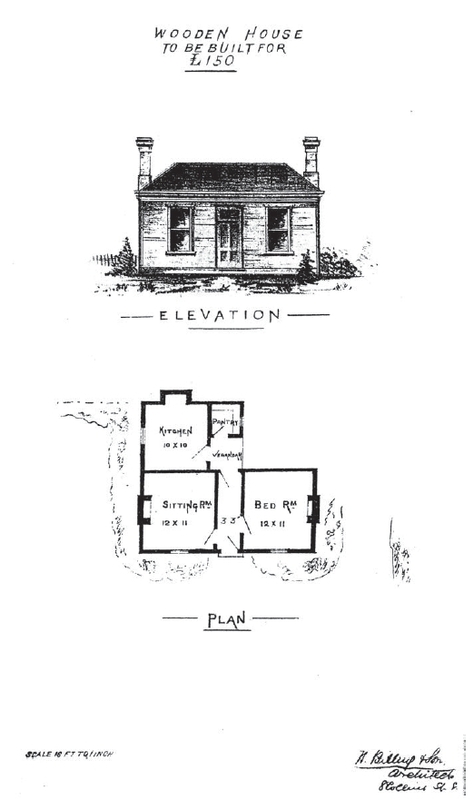 So how could I have ignored the “blurb” on the back of the 1884 CD – especially when it featured a sketch of a house complete with floor-plan. What did the “fine print” tell me – if I’d bothered to read it in the first place? A fascinating feature is a Universal Building Societies Supplement which includes 15 pages of architectural house plans of the day – layouts and elevations – with the house price for each. These have estimated prices ranging from £150 for a basic wooden house to substantial brick dwellings for just over £1000 – with servants room included. Wow – what an amazing supplement – 31 pages in total. And what was even more fascinating were the plans for the smaller wooden cottages – designed by an architect! It was also a chance to learn about Building Societies and mortgages and how our ancestors may have purchased or built their home in 1884. 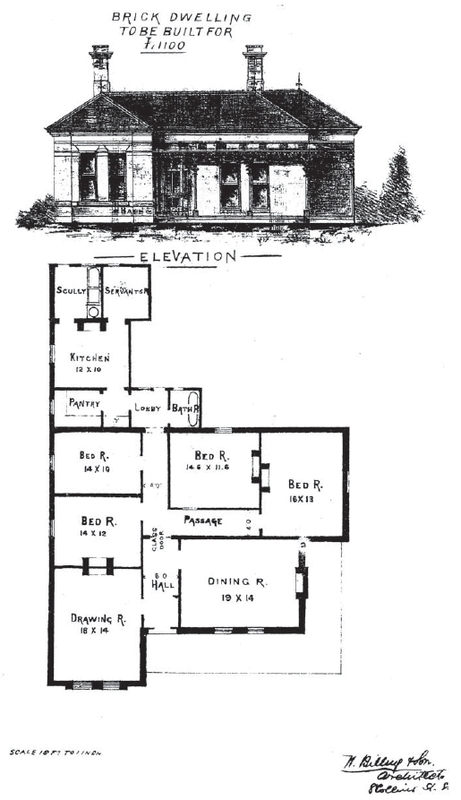 Billing had been an architect of interest for some time and even more so last year when I was researching a house associated with Swinburne University in Hawthorn. I had located the sewerage plans which gave the footprint of a “mystery house” until photos were uncovered to show the house in all it’s glory. Research showed that the house was possibly built or enlarged by the architect Nathaniel Billing. The lesson? READ THE FINE PRINT and never presume you know what a publication really contains. I had even ignored the Bookmarks contained in this Sands and McDougall’s CD – I confess I hadn’t click on the bookmark titled “Universal Building Society” – the bookmark was totally correct for the title in the Directory – it just didn’t jump out at me and I had never clicked on it. Will I learn my lesson – I really hope so. In the meantime I’m sharing this with you to encourage you to read the fine print and click on “boring sounding” titles – you just never know what absolute gem is hidden there!